We love advising you on what there is to do in Port Grimaud, whether it is for a day, a weekend or a week. Today, we would simply like to present Grimaud our village to you : its history but also what you can discover if you spend a day here. Grimaud is a high medieval village overlooking the clear blue bay of the Gulf of Saint Tropez, and is dominated by the remarkable ruins of the castle dating from the 11th century. The village is situated on the Mediterranean coast in the Maures Massif, the wooded hills which extend to the south west up to Pierrefeu-du-Var and Hyères, and to the north east in the direction of Fréjus. The sinuous D558 road which links the Gulf of St Tropez crosses the Maures after La Garde-Freinet, through oak, chestnut and pin forests. The winding D14 road,which is even narrower, runs towards the west of Grimaud through the hills up to Collobrières, passing close to Chartreuse de la Verne. The origin of the name Grimaud remains uncertain. Certain historians thought that it comes from Grimaldi, the family who reigned over Monaco, but this origin is debatable. The vestiges of the pre-historic times are the hills of Grimaud which comprise of 2 menhirs; situated 3 km to the north west of the village, on the Couzes farm and on the Avelan side of the hill; one of two menhirs has an anthropomorphic side. At Our-Dame-de-la-Queste there are some basalt mills (black washed stone), and a sculpted Phoenician Carthaginian head can be seen in a cave situated in what we today call Port-Grimaud. In Ancient Times, Grimaud was the port of Sambracis, and several ancient gallo-roman objects were discovered in the area, notably large stone pots two meters high found buried underground for anchoring boats. A very large number of Roman ceramics were discovered here, notably amphora and slabs. 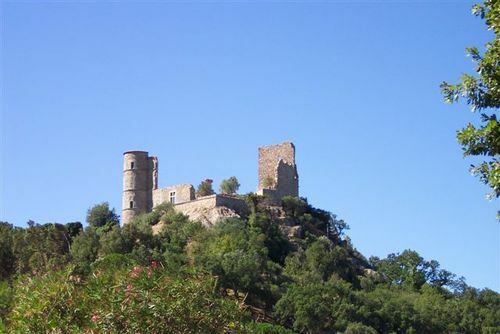 Grimaud was the Domaine of the Viscount of Marseille, then the Lords of Pontevès and Jean Cossa and, up until the 17th century, Lords of Castellane-St-Juers. The high position of Grimaud offers a magnificent view over the surrounding hills and the Gulf of Saint Tropez, a bay which carried the name of Gulf of Grimaud until the 17th century. The overhanging passage which crosses the center of the Maures offered Grimaud a strategic position in the Middle Ages. The village has been carefully restored, but not excessively so and has successfully retained its authentic character. Certain houses in the village date back from the 15th and 16th centuries. Many of them have been built with stone walls in the ancient style, and numerous others have been restored with luminous paste colors typical of Provence. In the rue des Arcades, you’ll see a house dating from the 15th century called the House of Templiers, whose façade and underground area are typical of the time. 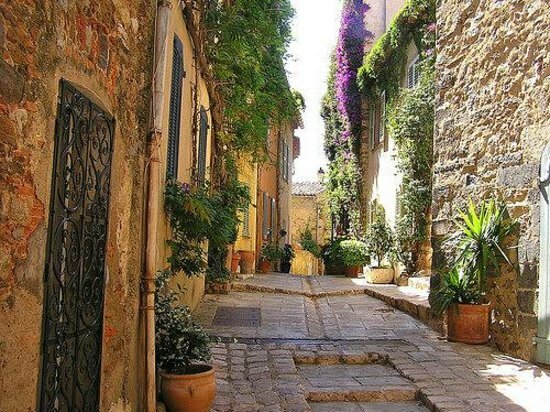 The village is rather grand for a provencal village and you can easily spend half a day winding your way around the streets, exploring them, especially certain narrow medieval passages and a few passages with low vaults. The Tourism Office offers visitors a free brochure which offers a walking tour of Grimaud, and you can view the corresponding signs on the buildings offering the visit itineraries. Several old village fountains are really interesting and, in particular, that of the Place Neuve dating from 1886. The fishing villages and the villages on the other side, so typical of Provence and so picturesque, can be a problem for young children, people with reduced mobility and the elderly. Luckily, Grimaud has built a glass and iron lift (to transport people to the village or to the main part of the village, where the town hall certain main buildings and other shops are found). 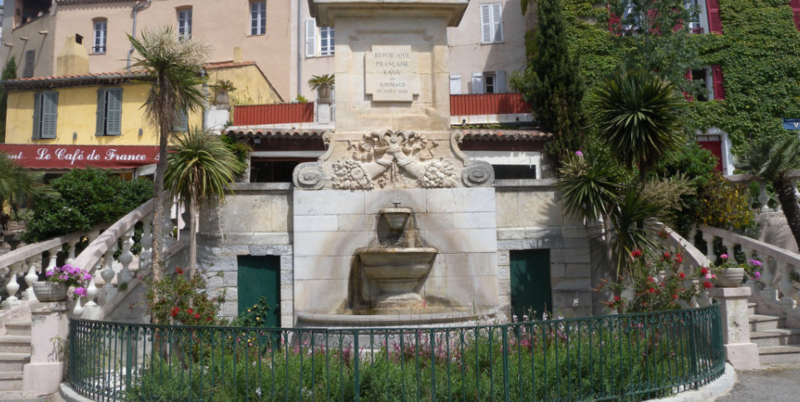 All Grimaud’s water was supplied by three Middle Age wells up until the 16th century. Then, an aqueduct system was built to lead the water from the Pont des Fées (3 km to the north) towards the castle and the village. Some remains of the aqueduct are still there and le Pont des Fées dating from the 15th century which crosses the river Garde, is a magnificent ancient site. From the 19th century, the expanding population required more water and an air pump was built in 1886 to guide the water to the village from a low lying source. The village church is Saint-Michel church. It dates from the 12th century and is a Roman parochial church with a square bell tower. There is also the lovely stone Chapelle des Pénitents Blancs in the village, which was built in 1482. La Chapelle des Pénitents Blancs : « The Chapel of the White Penitents ». Grimaud has a vibrant commercial village life, but the shops are located in several locations throughout the village. There is a grocer, a butchery and three bakeries/confectioners. You can also find several real estate agencies and numerous art galleries. Grimaud is situated in the wine region of Provence, and the local vineyards offer the famous wines « Côtes de Provence AOC”. A wine cooperative is situated not far from the village. The other specialities produced here are honey, flowers, sweet chestnuts and cork. Cette entrée a été publiée dans English le 5 décembre 2016 par Boutemyblog.